GFDD Wishes Everyone a Happy Holiday Season! DREFF 24/7 is the online platform to enjoy environmental films that were part of past editions of the Dominican Republic Environmental Film Festival (DREFF) and others that complement and enrich the program, at home or from any mobile device. DREFF 24/7 is DREFF à la carte, anytime, anywhere!. DREFF’s Year Round Environmental Screening initiative celebrated the film series ‘Love the Earth’ alongside the Ministry of Culture, the Ministry of the Environment, and the Dominican Republic Film Commission (DGCINE) at the Cinemateca Dominicana, located in Santo Domingo’s Plaza de la Cultura. The initiative has the overarching goal of bringing about awareness of current difficulties surrounding natural resources around the world. Central to the struggle of this film series is the desire to open community members’ eyes to environmental harm resulting from industrialization, consumerism, and the excessive exploitation of our planet’s natural resources. Alongside Funglode’s Center for Economic Studies, GFDD presented the launch of the Spanish translation of Jenna Giandoni’s Impact Investing in the Dominican Republic during an activity held at Funglode headquarters in Santo Domingo. The event served as a venue to discuss salient points and findings concerning the burgeoning field of impact investing, and counted on participation from Jenna Giandoni, GFDD fellow and author of the study which gave name to the event. GFDD met with leaders and members of the Colegio Dominicano de Periodistas en Estados Unidos (CDP-US – Dominican Journalism Association in the United States) to discuss possibilities for future alliances between the institutions. The reunion came about thanks to the support of Josefina Álvarez, a US-based collaborator for GFDD, and took place in GFDD’s New York office, located in the neighborhood of Washington Heights. Two Dominican films, Jeffrey and Site of Sites, were part of the 6th Annual ‘REEL Time at GALA Film Festival’ in Washington, DC, which was presented in collaboration with GFDD. On two evenings of the festival, Washingtonians enjoyed these movies and post-screening panel discussions with experts, including Hugo Pagan, Dominican film critic and marketer, blogger and distributor; curator Carlos Gutierrez; and María Victoria Abreu, GFDD’s International Affairs and Socioeconomic Program Manager. With an arts and crafts bazaar held at its Washington, DC office, GFDD officially started the 2017 holiday season. The event was celebrated in collaboration with the Embassy of the Dominican Republic to the United States, and provided an opportunity for the Washington community and friends of the Foundation to enjoy traditional Dominican music while being able to buy local gifts for their loved ones. At the 2017 International Conference of the Americas! In a collaborative effort between the Dominican United Nations Association (UNA-DR), GFDD/Funglode, and the Mexican civic organization GlobalMuners, this year’s International Conference of the Americas brought together more than 500 high school and university students from the Dominican Republic, Mexico, Colombia, Venezuela, and other countries in the region. During the conference, simulations were carried out involving eight bodies and commissions of the United Nations and other regional and multilateral international institutions. CILA 2017 also included seminars, conferences, workshops, and exhibitions in addition to cultural and social activities dealing with topics directly related to the agenda of the United Nations. For the first time ever, the Dominican Film Showcase goes to Costa Rica! 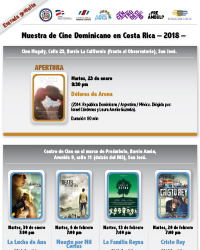 Every Tuesday from January 23 to February 20th, Costa Ricans will be able to enjoy some of the best Dominican films, including: Dólares de Arena, Death by a Thousand Cuts, La Familia Reyna, La Lucha de Ana and Cristo Rey. All screenings will be free and open to the public. These events are a joint effort of GFDD/Funglode with the Dominican Embassy in Costa Rica, DGCine (DR Film Commission), the Centro Costarricense de Producción Cinematográfica. 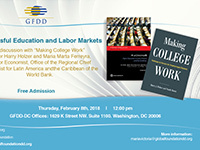 GFDD is hosting an interesting discussion on successful education and labor markets, with Professor Harry Holzer, Author of "Making College Work: Pathways to Success for Disadvantaged Students", and Maria Marta Ferreyra, Senior Economist, Office of the Regional Chief Economist for Latin America and the Caribbean of the World Bank. When: Thursday, February 8th, 2018 at 12:00pm. Where: GFDD-DC Offices (1629 K Street NW. Suite 1100. Washington, DC 20006). Free admission! Light refreshments will be provided. The Environmental Film Festival in the Nation’s Capital (DCEFF) is the world’s premier showcase of environmentally themed films. Since 1993 its mission has been to celebrate Earth and inspire understanding and stewardship of the environment through the power of film. The Dominican Republic Environmental Film Festival (DREFF), a GFDD initiative, has been a partner of DCEFF for many years and celebrates a Dominican Night every year. In 2018, two new environmental Dominican films will be screened, including panel discussions with the filmmakers.